ONE of the few predictable factors about winter walking in Scotland’s mountains is unpredictability. You can plot and plan with as much precision as you want, but once you are on the hill all bets are off. Calculated book times are reduced to a fantasy as you struggle uphill with a heavier pack and heavier layers, one minute sinking in ankle-deep glaur, the next detouring widely around stretches of iced rock and grass. When you reach higher ground, there’s the constant uneven stagger across the blown snow, one calf-deep plunge for every two solid ones, the impossible search for a consistent rhythm. Suddenly that three-hour walk has turned into a possible four or five, the legs are becoming weary and the mind starts following suit, especially when you factor in that the way back is not going to be any less formidable. It’s so easy to get caught out. Coming down in the dark is the norm at this time of year, but the trick is make sure you are not still struggling around on dangerous ground when the light is snuffed out. My last four outings have all involved a walk out in the dying embers of the day, and twice a head torch was a necessity. No big multi-peak days, nothing too ambitious, just single hills but still with little margin for error. 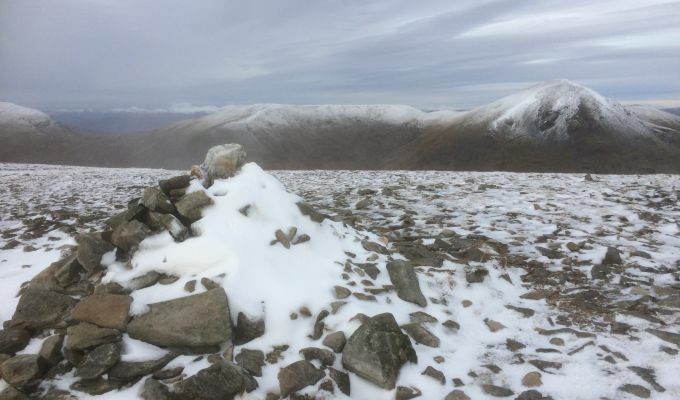 We did have grand plans for last weekend, a long day in the Cairngorms, but as the weather forecasts shifted hourly to less favourable, we looked at shorter options. The uncertainty eventually brought a consensus – there was nothing we could do together that didn’t involve a long journey. I switched my attentions to the Mallaig road, then noticed it could be one of the first casualties of an approaching front. A Borders circuit seemed a better bet and that was the choice right until I was ready to leave the house at 5am. 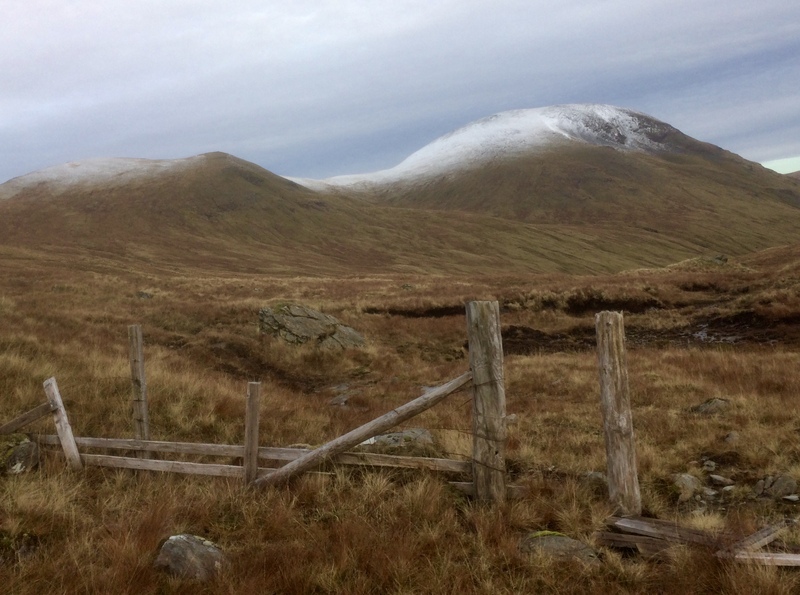 Then it clicked that I still had a lone Munro at Bridge of Orchy to tidy up for this round. Not too long a day and not too far away if the weather went pear-shaped. Beinn Mhanach has never set pulses racing. A rounded lump set in the midst of far superior peaks, the trade route up Auch Gleann involves crossing the river several times. I fancied an alternative, climbing from the farm at the north end of Loch Tulla to the col between Beinn an Dothaidh and Beinn Achaladair, and then dropping off the other side, a shorter route according to the SMC’s Munros guide. Only it wasn’t. It took me longer. There may be slightly less distance to cover, but it’s on much tougher and steeper ground, especially in winter conditions. It started promisingly, a bright rising sun, blue skies and no wind. The minus temperature had hardened much of the bog and mud in the corrie, frozen footprints providing a form of carbon dating of those who had recently passed this way. Higher up, icy rocks at stream crossings meant detours which ate up more time. The grass slopes off the back of the col were treacherous in places, booby-traps of frozen water everywhere. The sun had now vanished, swallowed by skies muted in the dim low light. 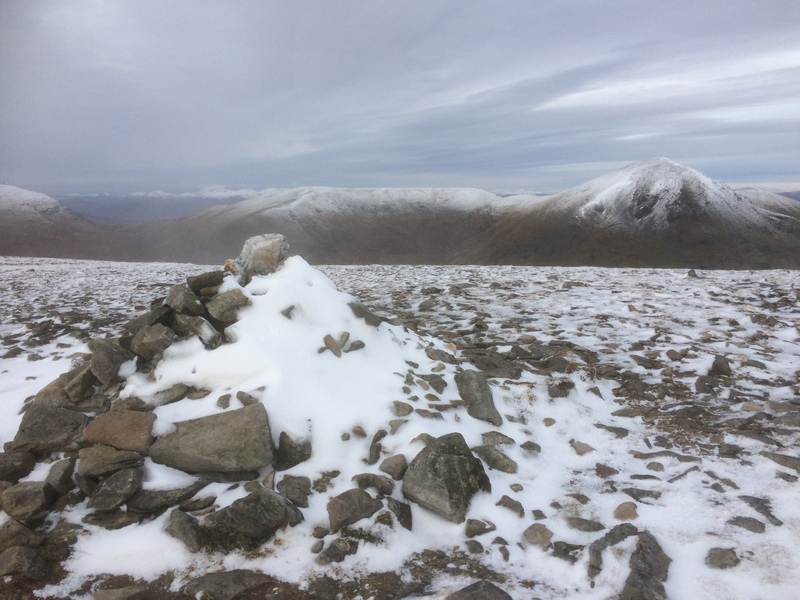 The re-climb to Beinn Mhanach was slow, interrupted by diversions to avoid sections of sheet ice and the final walk across the summit plateau was a lop-sided mix of crunch and sink. The return journey was less anxious, but the rise in temperature over the piece meant the bog was now back to its boot-sucking best. I arrived at the car in darkness, feet soaked. A shorter walk which turned out be longer. A warmer and more benign day than the week before in the Cairngorms, yet the ground was icier, more troublesome. A walk that felt like more effort, both mentally and physically, than the higher and longer circuit of the previous week. In other words, a typical winter walk, where everything was turned on its head.